I’m getting prepared for the 30-Day Vegan Program by making some significant modifications to the food that I have on hand. 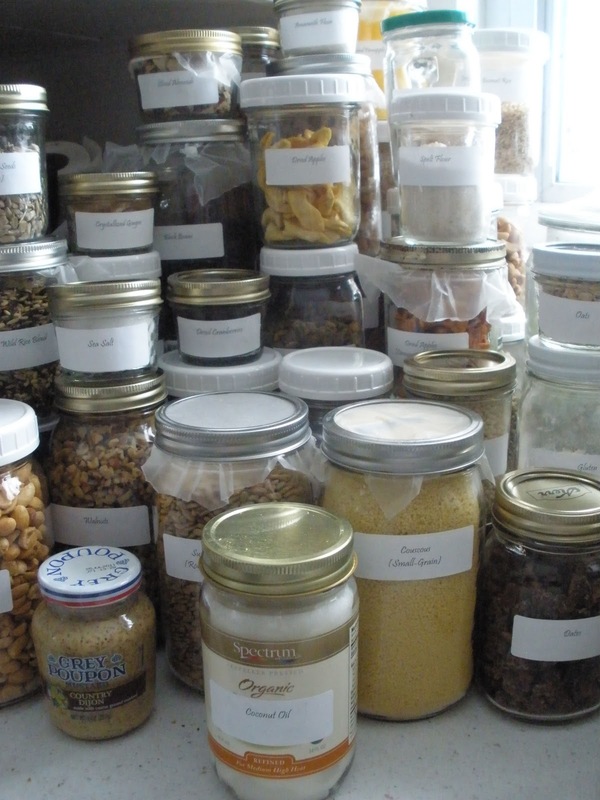 Spent most of Sunday cleaning and organizing the cupboards so that all the healthy food is in canning jars and labeled. labeled and ready to use. Need to work on a couple more cupboards as well as the refrigerator so I’m prepared on March 7th when the program begins. (e.g., beans, dried fruit, grains, flours). I have a quilt square I need to complete by the middle of the week for a swap on Swap-Bot. The major project of the week: my office. I have to file and start doing taxes this week. 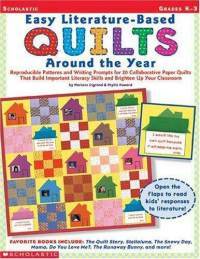 – Finish the paper quilt for February using the book Easy Literature-Based Quilts Around the Year by Mariann Cigrand. – Do another Outdoor Hour Challenge using the book Handbook of Nature Study by Annna Botsford Comstock; and have the girls add to their nature journals. – Learn about and do activities related to Dr. Seuss’s Birthday (March 2nd) and Alexander Graham Bell’s Birthday (March 3rd). – Do two more art lessons using the Atelier program as well as do a new type of Waldorf painting that combines wax crayons, oil, and aromatherapy. – Continue doing activities related to Ukraine (this is the ABC Journey Around the World that I’ve been doing with the girls for a couple years now). This week, I’d like the girls to learn how to make some of the Ukrainian recipes as well as try making pysanky (the decorated eggs using the wax-resist method and dye). – Begin learning about Wales on March 1st when St. David’s Day is celebrated there (St. David is the Patron Saint of Wales). 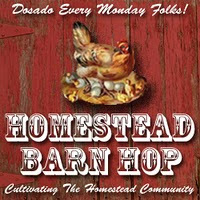 The homeschool co-op is on Monday. Sophia takes piano lessons, ceramics/pottery, and home economics. Olivia takes American Heroes, computers, and ceramics/pottery. Both the girls have choir on Wednesday evening. On Thursday, I’m helping my parents with chores around their home as well as errands they need to do. On Saturday, my parents are taking us all out to eat. Doing the Outdoor Nature Hour Challenge that was focused on birds. The girls and I also spent time doing snow-related science activities which were a lot of fun. the limb of a fallen tree. Also, we enjoyed making Hygiene Kits that will be shipped worldwide to people facing natural disasters, violence, or extreme poverty. What I enjoy about homeschooling is that we can spend longer periods of time on particular subjects that either interest the girls or that they are finding challenging and with which they need extra guidance. What is a challenge right now is waiting for the assessment that the school district is doing on Olivia to help determine why she is struggling with reading and math. The anticipated date that I should have their report in hand is April 11th…right before the homeschool conference. This hopefully will help determine what curricula and strategies to use that will make learning easier for her in these subjects. It’s more of a dream…as the girls begin learning about United States geography, I think it would be incredibly educational (and fun) to be visit each of the 50 states to make learning about them more “real.” If the goal would be to learn about each of the 50 states, say, one per month, it would take about four years for an in-depth geography study. It would be interesting to visit a group of states each quarter. to reveal the new growth. will watch them grow during the upcoming weeks. After the photos and information about the window stars, there is a list of team members’ names who are participating in the blog hop as well as links to their blogs. You can visit each blog to see the creativity of the team and how each person interprets the theme. This is a very diverse team, so it’s interesting to see the different materials used. The theme for this month’s blog hop is “Something Green.” With Mardi Gras and St. Patrick’s Day both happening during March, I created a trio of miniature window stars. This 4″ star is folded 16 times per point…for a total of 128 folds. The window stars are made by folding a special kind of translucent paper multiple times per point and then gluing the points together to reveal a pattern. In the window star above, for example, each point is folded 16 times before it is glued to the next point. With 8 points, the star requires 128 folds. Each window star available through Harvest Moon by Hand has a different number of folds. Some are very basic (like the dark green star which has only 5 folds per point) and others are very complex with over 25 folds per point. As noted above, the stars are all miniature versions of larger ones that are available at Harvest Moon by Hand. The stars are only 4″, 4.25″, and 6″ (10, 10.75, and 15 cm) in diameter. The paper size for each point ranged in size from 1.5″-3″ (3-4.25 cm) square. To see green window stars that are currently available at Harvest Moon by Hand, please click HERE. For this week’s 52 Weeks of Giving program that Sophia, Olivia, and I are doing, we each are assembling Hygiene Kits for Church World Service (CWS). In the face of natural disasters, violence, or extreme poverty, Hygiene Kits can mean the difference between sickness and health for struggling families. The Kits that volunteers make are packed with other same-type Kits and prepared for shipment to various points throughout the world, when and where the need is the greatest. In addition to Hygiene Kits, CWS also has a variety of other kits that are small packages of supplies assembled by volunteers and shipped to people in need around the world. CWS provides assistance to people in need regardless of their race, ethnic origin, or religion. As instructed, we placed all of the items in a one-gallon plastic bag with a zipper closure, removed excess air from the bag, and sealed it. We didn’t add toothpaste to the Hygiene Kit because CWS includes a carton of toothpaste that has an extended expiration date to the Hygiene Kit just prior to shipment. displaced people, and victims of natural disasters. When packing and shipping kits, you put only one type of kit in a box (all hygiene kits are packed together, all emergency clean up buckets in another, and so forth). Before sealing the box, a Kit Coupon is put on the top of the kits. CWS requests a small donation (at least $2 for each Hygiene Kit) to cover sorting, packing, and insurance, as well as shipping Kits to their final destination. Cash donations in lieu of assembled Kits also help them to provide much-needed supplies. For more information or answers to questions, call CWS at 1-800-297-1516. A quake survivor in Haiti bathes her child. Note on March 10th: On March 7th, Church World Service sent a thank you note saying, “I want to thank you for your generous contribution – especially appreciated in this challenging economy. Thanks to caring donors like you, Church World Service can provide food, water, and other necessities to families displaced by natural disasters, as we are doing in Pakistan now. “In a world wounded in so many ways, I remain hopeful because of the creative, resilient women, men, and children we assist around the world, and because of caring people like you, who empower us to act on your behalf. May God bless you for your compassionate support. Also this week, the girls and I have been cleaning the home and packing items that we no longer need/want or that no longer fit (in the case of clothing). We dropped off another donation to Family Pathways, a second-hand store. All the proceeds from the items that are sold directly fund the non-profit organization’s programs that benefit those in need (families and individuals; and youth to seniors). I’m on Week 8 of 52 Books in 52 Weeks; and was at the library this week looking for a book to read. Was browsing the aisles and wandered down an aisle I don’t normally visit and was looking at the shelves in the 306s. 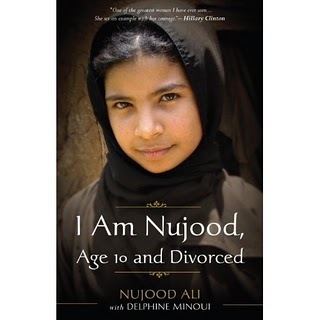 Read the title I Am Nujood, Age 10 and Divorced by Njuood Ali with Delphnine Minoui, and thought, “Did I read that correctly?” Pulled the book off the shelf. Sure enough. That’s the title. Thought it, perhaps, had to do with a child who divorced her parents. Every once in a while I hear about a situation where a child has formally broken ties with her/his parents due to overwhelming neglect or abuse. This wasn’t the case. The book is about Nujood and how her childhood came to an abrupt end in 2008 when her father arranged for her to be married to a man three times her age. With harrowing directness, Nujood tells of abuse at her husband’s hands and of her daring escape. With the help of local advocates and the press, Nujood obtained her freedom – an extraordinary achievement in Yemen, where almost half of all girls are married under the legal age. Nujood’s courageous defiance of both Yemeni customs and her own family even inspired other young girls in the Middle East to challenge their marriages. Recently honored alongside Hillary Clinton and Condoleezza Rice as one of Glamour magazine’s women of the year, Nujood now tells her full story in this book. As she guides us from the magical, fragrant streets of the Old City of Sana’a to the cement-block slums and rural villages of this ancient land, her unflinching look at an injustice suffered by all too many girls around the world is at once shocking, inspiring, and utterly unforgettable. Although this isn’t a book that I would typically read, it is one that has caught my attention and brought awareness to a serious issue that is all-too-prevalent in the Middle East. At the back of the book, there’s information about a non-profit organization that helps girls who have been forced to leave school and those who are young victims of early marriages to continue their education. “Outdoor journaling is something a family can do together, and it offers reason and focus for being in nature. Linda Chorice, assignment manager at the Missouri Conservation Department’s Springfield Nature Center, points out that journaling demands no special equipment, only a pad of paper or a spiral notebook, several pencils, and a pencil sharpener. “‘While your journal may never be published as a historical document, it will serve as a personal record of your outdoor experiences, allowing you to accurately relive your memories each time you open its cover,’ she says. three mushrooms and two pods from an invasive perennial vine. Have no idea what it is, but wish it wasn’t here. 1. Read pages 16-17 of the Handbook of Nature Study (HNS). Highlight or underline those parts that will help you understand better the connection between nature study, language arts, and drawing. Nature study lessons give much excellent subject matter for stories and essays, but these essays should never be criticized. They should be read with interest by the teacher. I didn’t point out the error to Olivia. The correlation of nature study and drawing is so natural and inevitable. onto a scale. They wanted to see how much everything weighed. The other quote I liked is noted below under #3. Seed pods that have prickly parts on the outside. The inside of the dried pods are hollow. Don’t worry about taking any equipment with you this time. Continue working on being quiet and observing things with your senses. While on your walk, be alert to new subjects for your further research. We will be going on a couple of nature walks this week. The girls have asked to go to a nearby state park with the dogs which would be nice. We have not hiked there in the winter – only in the three other seasons – so it would be interesting to look at what the park looks like in the fourth season. The nature journal entry that the girls did today related to another one we took last week in which we discovered some mushrooms on a tree in the pasture. They also recorded in their nature journals a bit about the salt crystals they made. They used magnifying glasses to see the crystals. Although they were certainly larger when viewed through the magnifying glasses, they certainly were not large enough to see each individual salt crystal and its unique formation. 3. Follow up with discussion and the opportunity for a nature journal entrry. The top two circles relate to the salt crystals in the bag. that relate to the fuzzy mushroom (also in the bag). Discuss your nature time with your child and again try to draw out some words from your child’s experiences. Keep in mind what you read about the connections between nature study, words, writing, and drawing. Your child might need help deciding on a subject to record in their nature journal. You should explain that you would like them to start making a book of with their experiences from their nature study. If they make a page for the book each time they have nature time, they will have a whole book filled with their own words and drawings to look at by the end of the year. If they are reluctant, write down their descriptive words on a sheet of paper and leave a blank space where they can come back later and draw if they feel like it. We’ve done this before during the summer when the leaves are softer using both colored pencils as well as crayons. The girls also have done fabric printing using leaves. 2. Tape small flat things into the nature journal. (leaves, flower petals, seeds). salt crystals in todays’ journal entry. Sophia taped the fuzzy mushroom onto the page so it could be easily felt. stapled in her nature journal. 3. Print out a photo that you took while on your nature walk and let the child write the caption. The girls both have quite a few photographs in their nature journals from past walks and trips to the zoo. One of the goals during the next week is to make sure that all the photographs are labeled with what they remember from the image in the photograph. 4. Press flowers or grasses between pages of a book and later add it to the journal. (We will learn more on that in a future challenge this spring.). Last week, the girls put a piece of corn husk into the nature journal as a reminder of Montague (the dog) wanting to chase after a corn husk on our nature walk. 5. Outline an object with a pencil and then color it in. Both Sophia and Olivia chose to outline the large mushroom and then add some details after they traced it. a dried seed pod from a vine. Olivia’s tracing is pictured above. Nature journaling is meant to be a follow-up activity and not a replacement for your time spent outdoors. Please feel successful in this challenge whether you end up with a nature journal page or not. If they don’t draw this week, maybe they will want to make a page next week. Take a look at your attitude towards outdoor time. Has it changed since starting these challenges? Are you committed to keeping up your Outdoor Hour time because you see the benefits stacking up in your family? I definitely am making more time for nature walks and journaling since starting the challenges. This use to be something that we enjoyed regularly doing, and had moved away from it during the past year or so since beginning using a new curriculum which included a science component. Starting in 2011, I realized that one thing I missed was the creativity and spontaneity of homeschooling. Somehow, I came across the Handbook of Nature Study website and started reading about the challenges. I had a copy of the HNS book, and thought it might make a nice addition to the girls’ homeschooling. The time we’ve spent taking nature walks together as well as the time we spend afterwards journaling about experience has been a highlight of our weeks since beginning the Outdoor Hour Challenges. Have you started keeping your own nature journal or photo album of your experiences outdoors with your children? I began using my nature journal again. My thought is that if I’m doing what I want my daughters to do, they will be more likely to do the activity. This goes for nature journaling as it does any other activity (e.g., feeding the horses and cleaning the barn; cleaning my room; reading books and magazines for pleasure). The other thing I’ve done is take quite a few pictures of our walks and nature journaling time. Some of the pictures I’ll print for the girls so they can include them in their nature journal. For other photographs, I’m including them on this blog along with a description for each of the Outdoor Hour Challenges. I read that Blogger.com has a program which gives people a chance to print their blog (or portions of it) into a book format. I thought printing the postings of the Outdoor Hour Challenges might be nice for the girls to look back upon. Writing and photographing (both the nature walks and journal times) have been such an enjoyable way for me to remember and reflect upon homeschooling. I am so thankful for the many opportunities that the girls and I have to learn together. For the past few years, the girls have been learning about different countries around the world. I wanted to give some order to studying world geography, so I chose to do it alphabetically. So far, we have learned about: Australia, Brazil, China, Denmark, Egypt, France, Germany, Hungary, Ireland, Japan, Korea (South and North), Laos, Madagascar, Netherlands, Oman, Peru, Qatar, Russia, Spain, Turkey, and now we’re on Ukraine. They include some postage stamps from the country they are studying. Something that I haven’t done before, but thought it would be fun is to make a cookie map of Ukraine. We rolled out the dough and then placed a paper outline of Ukraine on top of the dough. Using a knife, Sophia cut out the shape and placed it on a cookie sheet to bake. After the cookie cooled, the girls had fun decorating it with frosting and sprinkles. We read several books (non-fiction and fiction) about the country. For Ukraine, we read and/or looked at Nations in Transition – Ukraine by Steven Otfinoski. In Nations in Transition – Ukraine there was section about a couple rather sobering events that took place in Ukraine. The first was the Chernobyl disaster that occurred on April 26, 1986, at the Chernobyl Nuclear Power Plant in Ukraine (then in the Ukrainian Soviet Socialist Republic, part of the Soviet Union). It was considered the worst nuclear power plant accident in history. We looked at some photographs on the internet of the towns near the power plant (which has since closed) that have now become ghost towns. I remember this disaster because I was almost 20 years old at the time, so we talked about this for awhile. The other thing we read about (not in great detail…just so the girls are aware that it happened) is Holodomor – the famine in 1932-33 that claimed the lives of over four million people. Holodomor literally means “killing by hunger;” and only within the past eight years has it been legally acknowledged as genocide against the Ukrainian people. More can be read about it HERE and HERE. In addition to the non-fiction books, I read two different versions of The Mitten which is a Ukranian folktale. The first version, written by Alvin Tresselt, has simple illustrations and is an older book. The second version is written by Jan Brett and has beautiful illustrations and some different animals than the other book. The girls enjoyed discovering the differences between the books. 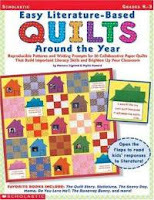 During March, the girls will be doing a paper quilt from the book Easy Literature-Based Quilts Around the Year by Mariann Cigrand and Phyllis Howard. 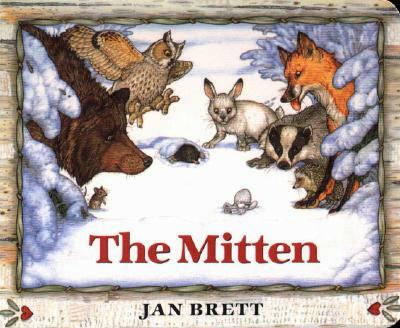 The design and activity ties in The Mitten by Jan Brett. An important part of each unit study is trying new recipes from the country. One of the recipes we made that the girls liked a lot was Chicken Kiev. We made Chicken Kiev when we were studying about Russia as well, but the filling is a bit different in this version. putting it in eggs and covering it with breadcrumbs. The girls eating Chicken Kiev with vegetables and a salad. We also made Kovbasa and Kapusta (Ukrainian Sausage and Sauerkraut). Olivia made the toasted rye bread and Sophia made the sauerkraut and sausages. The recipes said to cut up the sausage and put them in the sauerkraut. Since I figured the girls wouldn’t care for the sauerkraut, I didn’t have them do this step. Instead, they ate the sausage and sauerkraut separately. I remember growing up and having sauerkraut at dinners at my Grandma’s home. It wasn’t my favorite dish that my Grandma made (and she was an amazing cook/baker). This sauerkraut recipe had more flavor with caraway seeds and onions. We’re looking forward to making Holubtsi (Stuffed Cabbage) as well as several types of breads. Pysanky design that Olivia colored. with dye and the wax-resist method soon. Studying about Ukraine at this time of the year is wonderful because many of the activities that we will be doing tie into Easter: making Babka and Pashka (two types of breads); and pysanky (eggs which have been decorated with a wax-resist method). What the girls found interesting is that Ukrainians bring Easter baskets to church where they are blessed. Each basket is packed with symbolic foods, candles, and pysanky; and covered with a white linen cloth that signifies Christ’s shroud. After church, people carry their baskets home and feast on the contents for breakfast. 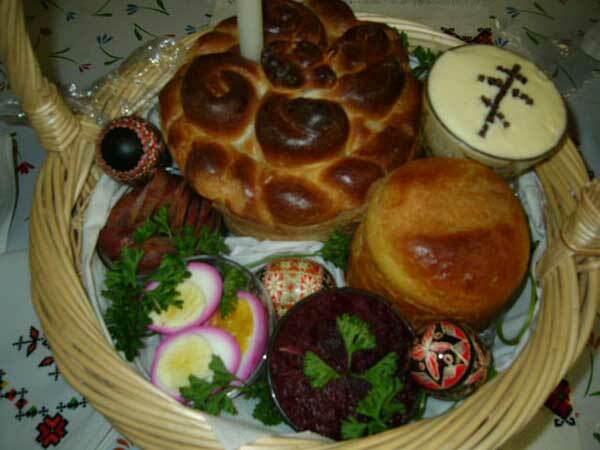 A typical Ukrainian Easter basket contains an array of symbolic foods, including paska (a large, round bread symbolizing the joy of new life); boiled eggs (which symbolize rebirth); and kielbasa (a spicy garlic sausage which represents generosity). In another picture of a typical Ukrainian Easter basket, bacon and ham are included. I recently found a recipe for home-cured bacon. The girls thought it would be interesting to learn how to make their own bacon. So, that will be one of the activities that is part of this unit study. Sophia and Olivia also learned about Ukrainian textiles, and the importance of embroidered decorative towels. The towels mark special events and times in a person’s life. More can be read about how towels are used HERE. We also looked at some of the designs in the book Ukrainian Embroidery by Ann Kmit. And…because the girls are at an age where they’re interested in hair…they learned about Prime Minister Tymoshenko and how she used to braid her hair in a traditional Ukrainian style (her hair was braided and then wrapped in a circle around the back of her head – almost like a crown). The Ukrainian Gift Shop is located at 2782 Fairview Avenue North in Roseville. It’s near Rosedale Mall. The phone number is 651-638-9700. They have a wide variety of supplies to make pysanky eggs as well as other items from Ukraine. They also have an online shop. We received a copy of their catalog today, and both the girls want to visit the shop to see the pysanky eggs and the holders. We’ll be continuing to study Ukraine until March 1st when we learn about Wales. (We’re skipping ahead since March 1st marks St. David’s Day in Wales and makes a logical introduction to that country.) After that, we go back to Vietnam, and then move forward with Mexico (since no country begins with an X), Yemen, and Zambia. By the end of the 2010-2011 school year, the girls will have learned about 26 different countries. At that point, we’ll shift to learning about each of the different states in the United States. This week’s focus for the Winter Series Outdoor Hour Challenge is winter birds (including bird migration). For this challenge, instead of picking a particular bird from the Handbook of Nature Study (HNS), the Handbook of Nature Study website suggested learning about bird migration and then spending some time outdoors looking for birds. The website also encouraged participation in the annual Great Backyard Bird Count that took place from February 18th-21st. Read in the Handbook of Nature Study pages 35-37. This will help explain why you have some birds in your area only during certain seasons. If you are interested in more information, you might want to check the Peterson Field Guides for additional information about particular birds that you have in your feeders or near-by parks. – The Arctic tern’s round trip mileage…is about 22,000 miles. – The Arctic tern has more hours of daylight than any other animal on the globe. – We see great flocks of swallows [before they migrate] …. Some birds do not gather in flocks before leaving for the winter; they just disapper and we scarecely know where they go. – Chickadees, jays, downy woodpeckers, nuthatches, grouse, and pheasants are typical examples of the permanent resident group. – The first migrants…are, in general, those which have spent the winter only a comparatively short distance away. [These are] robins, red-winged blackbirds, song sparrows, and bluebirds. – In many species, the males arrive first; they may come as much as two weeks ahead of the females. The immature birds are usually the last to arrive. – Usually the very first birds of a kind to arrive are those individuals which will within a few days continue their northward journey. The later arrivals are usually those that remain to become summer residents. – [Some species of birds have] double migration routes …. One route may lead chiefy over land while the other may lead over the ocean. The golden plover is an example of such a case. During the Great Backyard Bird Count, Olivia and I were sick; and Sophia was on the verge of getting sick. Therefore, we weren’t able to get outside and do a bird count. However, after the big snowfall on Sunday-Monday, we cleaned off the feeders of 8″+ of snow and re-distributed the seed we had on hand between the feeders to make it a bit easier for the birds. Give an opportunity for a nature journal entry after you talk about any birds you observed. Help your child identify any birds they saw if you can. Remember to check the table of contents in the HNS to see if your bird subject is covered in a lesson. You can use those suggestions to learn more about your backyard birds. The girls do a lot of bird watching, so they are very familiar with the permanent residents. During spring and fall, when the birds are migrating, we often birds that we’ve never seen before which is exciting. Sometimes we can identify them…other times, we are just happy that we saw a bird that we never saw before. If you have a field guide, use the information there to discuss if the bird is a winter resident or a year-round resident. Our family uses this online bird site to help us identify birds: WhatBird? And this website for additional information as well: AllAboutBirds. Also make sure to log into the Great Backyard Bird Count and record your results from your neighborhood. The snowstorm that traveled through central and southern Minnesota from Sunday night through Monday evening luckily didn’t leave as much snow as anticipated (at least here at the farm). The average snow depth was about about 8 1/2″, with some drifts as high as 12″. The girls definitely enjoyed finding evidence of wildlife around the yard. The most fascinating thing we discovered was a rather elaborate tunnel system through the snow that we’re thinking that a squirrel made since it led right to the squirrel/rabbit feeder. Near the pear tree there was a hole and then a pathway that led to two tunnel openings (see picture below). One opening led right up to the squirrel/rabbit feeder. The other opening led to an area under a nearby shrub that the birds, rabbits, and squirrels use for shelter and an eating area. Two tunnels leading the squirrel/rabbit feeder. Olivia was walking near the tall pine trees on the east side of the farm and was excited that there were a lot of rabbit tracks. While the girls were outside, I had them each fill a canning jar with snow. Sophia chose to pack the snow in her jar, while Olivia simply filled hers. The girls brought the jars inside where they started melting. About an hour or so later, Olivia wanted to check on the progress of the snow in her jar. By mid-afternoon, the snow had melted completely in Olivia’s jar (on the right, in the picture below) and had almost melted in Sophia’s jar (there was a small piece of ice in the center). Although Sophia’s jar did have more water, it wasn’t a tremendous difference between her jar and Olivia’s jar. This was rather surprising because we all thought there would be a more significant difference. The snow sparkled today – it was just beautiful! Initially the snow that fell on Sunday was a bit heavy, so that was packed down. The snowflakes that fell later on Monday were huge, (and for a lack of better words:) fluffy flakes that rested on top of the other snow. This morning, with the sun shining on the snow, it looked like crystals – or diamonds – gleaming in the light.